A package arrived in the mail. I opened the box, pulled out the priceless bundle and cried as I looked through photos spanning over 60 years. A childhood friend of Gary’s found out, through a Facebook post, about the fire we had in 1996 that destroyed most of our pictures. She went through her pictures and gathered up photos of precious memories–Gary as a child, family and friends, our wedding day, our first born son–and she carefully put them in a protective photo album and mailed them to us. The minutes it took for me to look through the pictures is about how fast it seems the past 60 plus years have flown by–in the blink of an eye. The brevity of life! That, too, is my response. I am totally shocked, blown away, at how fast the time has gone by. Below are moments in time, memories of days, of years gone by oh so quickly. Random pictures in random order of grandpas, dads, babies, and more–in celebration of Father’s Day and in celebration of Family–yours and mine. May we count our many blessings! Rex was our first born, followed by Luke four years later. We four had much fun during their growing up years. Now Rex and Luke are married with families of their own. WE HAVE SIX GRANDCHILDREN and the fun continues. Our family always looks forward to being together, hanging out and just having good old fashion fun. It usually includes food. My Grandpa…that’s Rex’s Great Grandpa holding two-week-old Rex–first grandchild! Rex with his first born, Beaux…celebrating Beaux’ FIRST BIRTHDAY! Walking already!!! Happy, happy times and smiles. Great Grandpa with first grandchild, Beaux. Rex showing precious newborn, Stella, to proud big brother, Beaux. Stella is so happy to see her big brother, even she’s smiling! Blessed family times! Precious Stella giving her daddy, Rex, a big hug. Lots of love, right there! Daddy and me, Thanksgiving 2013. We do have so very much to be thankful for! We’re catching up with you Grandpa and Grandma. Gary and I are at 44 years and counting! Three generations: Gary with our sons Luke (left) and Rex (right). Beaux is Rex’s son…our first born grandchild and our #1 grandson. Of our SIX grandchildren we have one grandson and five granddaughters. This is the only page of our daddy with his six children. Left-right: Bob Jr, Robin, Rosie, Rhonda, Dad holding Monique, and Eric. As I posted these pictures above I thought, FAMILY IS A GIFT FROM THE LORD! In Psalm 127:3b it says it like this, “Children are a gift from the Lord.” That is for sure! You’ve probably heard this before–the first picture that children have of Father God is the picture they have of their earthly father. Wives…think about that! That is an awesome responsibility that I, for one, would not want. It just makes me realize how much our husbands need our prayers. In fact, if we are not praying for our husbands, then who is? Sadly, perhaps, no one. 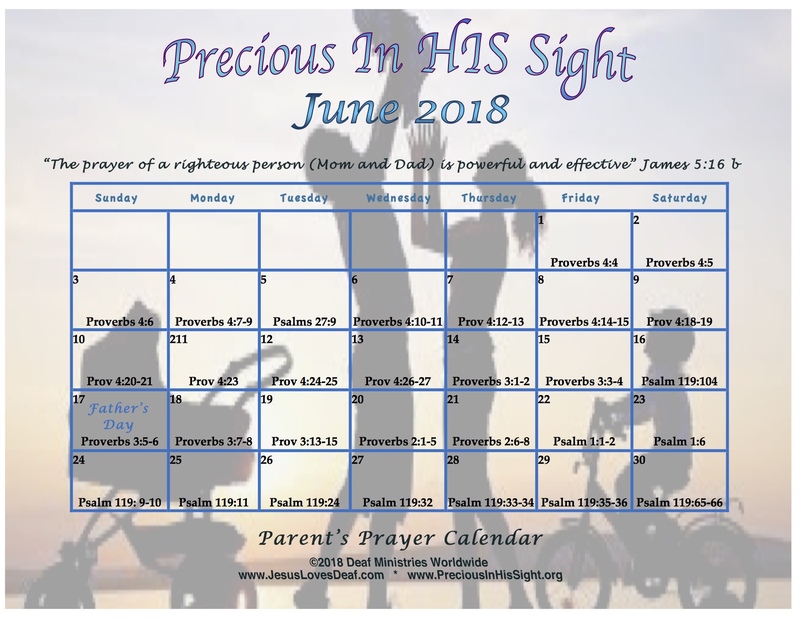 Although I pray for Gary, my husband, daily…this month…I’ll be specifically praying the Calendar Bible verses over Gary, too, along with our children and grandchildren. I encourage you to join me. Let’s pray God’s Word over the men of God that He has brought into our lives; let us show them with our prayers, words, and actions just how much they are loved and appreciated by us. There are many things we can spend, or waste, our time on. One thing that is never–NEVER–a waste of time is approaching the eternal throne of Abba Father and lifting our cares to Him because He cares for us. And He cares for our families. We read in James 5:16b, “The prayer of a righteous person is powerful and effective.” That is great news…let us pray without ceasing. If your father is still alive, be sure to send him a card, even call him and tell him how much love him. This is my third Father’s Day without my daddy. Even though he is with the Lord, my siblings and I love and miss him so much. IF YOU’RE A DAD, IT’S MY PRAYER YOU HAVE A BLESSED FATHER’S DAY! Previous Post What’s Better than This?